Book Launch: ESL or You Weren't Here Book by Aldrin Valdez! Join us in celebrating the launch of ESL or You Weren't Here by Aldrin Valdez! There will snacks, wine/beer, and readings by: Aldrin Valdez, Rio Cortez, Paolo Javier, Jimena Lucero, Sarah Sala, & Josh Wizman! 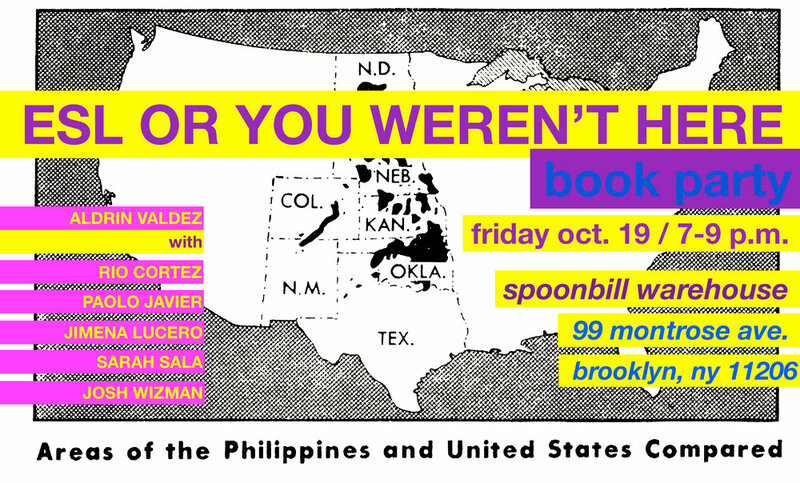 ESL or You Weren’t Here tells the story of a queer Pinoy who immigrates to New York in the 1990s in order to be reunited with their parents. What follows is the poet’s awakening to the legacy of American imperialism & colonialism in the Philippines, and to the experience of living between languages, cultures, temporalities, and genders—untranslatable. ESL asks the reader to bear witness to embodied histories of forced immigration, separation and abandonment rooted in patriarchal racism. ALDRIN VALDEZ is a Pinoy writer and visual artist. They grew up in Manila and Long Island and currently live in Brooklyn. Aldrin has been awarded fellowships from Queer/Art/Mentorship and Poets House. Their poetry & visual art appear in The Felt, Femmescapes, Nat Brut, Poor Claudia, and The Recluse. Aldrin has also presented work at Dixon Place, The Metropolitan Museum of Art, and The Poetry Project. Collaborating with writer & organizer Ted Kerr, Aldrin co-organized Foundational Sharing (2011-2015), a salon series of readings, performances, & visual art. Most recently, they've co-curated two seasons of the Segue Reading Series with fellow poet Joël Díaz.